During the past decade of persistent engagement by Special Operations Forces, U.S. Army Special Operations Command aviation experts recognized a need for separating the combat role of Army Special Operations Aviation from the resourcing responsibilities. This structure provides the appropriate command and control, manning and visibility for the complex and sensitive tasks required of ARSOF aviation units and organizations. ARSOAC is a one-star, subordinate command to the U.S. Army Special Operations Command. Special Operations Aviation traces its modern roots back to the early 1960s and the formation of Special Warfare Aviation Detachments (SWAD) and finally a task organized helicopter company as Army Special Forces prepared for Vietnam. The 22nd SWAD activated in March 1962 at Fort Bragg, N.C: In June 1962 the unit was reorganized and redesignated as 22nd Aviation Detachment (Special Forces). The unit supported 5th Special Forces Group (Airborne), 7th SFG (Airborne), U.S. Army Special Warfare School, and the 1st and 13th Psychological Warfare Battalions. The detachment was inactivated in December 1963. The 23rd SWAD (Surveillance) organized in July 1962 and flew the OV-1 Mohawk. The unit deployed to the Nha Trang, Republic of Vietnam in September 1962 to support I Corps and Special Forces with photographic intelligence. On 7 October 1965, the 281st Assault Helicopter Company, Airmobile Light (AML) was activated at Fort Benning, Ga. By 9 June the following year, the newly formed company set up its headquarters inside the 5th SFG compound at Nha Trang Bay, Republic of Vietnam. The unit's mission was to provide air movement of troops, supplies and equipment under the direct supervision of the commanding officer, 5th SFG. The 281st became the first organized special operations helicopter unit in the U.S. Army. Army historians consider the 281st to be the legacy unit for today's 160th SOAR. The unit earned decorations for Valor and Meritorious Service from the Army, Navy and Republic of Vietnam. In the years that followed, the individual SFGs had their own organic aviation detachment. These detachments usually consisted of 4 UH-1D helicopters, associated crewmen, and a limited maintenance capability. As a result of the Desert One failed Iranian hostage rescue in April 1980, the Holloway Commission, chaired by the former Chief of Naval Operations Admiral James L. Holloway, mandated a re-organization of the nation’s special operations capabilities, including a dedicated Special Operations Aviation force. The Army looked to the 101st Aviation Group at Fort Campbell, Ky., the air arm of the 101st Airborne Division (Air Assault), which had the most diverse operating experience of the service's helicopter units, and selected elements selected Charlie and Delta companies (UH-60) of the 158th Aviation Battalion, individual members of the 229th Aviation Battalion (Little Birds), and Alpha company of the 159th Aviation Battalion (CH-47) to form the basis of the unit. The chosen pilots immediately entered intensive training in night flying. Dubbed Task Force 160, the new unit was quickly recognized as the Army's premier night fighting aviation force, and its only Special Operations Aviation force. As pilots completed training in the fall of 1980, a second hostage rescue attempt, code named Operation Honey Badger, was planned for early 1981. It was called off when the hostages were released. In October 1981, the unit was officially designated the 160th Aviation Battalion. The 160th first saw combat during 1983's Operation Urgent Fury, the U.S. invasion of Grenada. In 1986, the unit was re-designated as the 160th Aviation Group (Airborne). 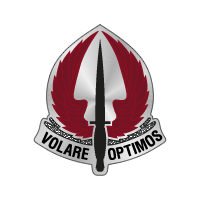 The modern day 160th Special Operations Aviation Regiment (Airborne) was officially activated in June 1990. As demand for highly-trained Special Operations Aviation assets grew, the Regiment activated three Battalions, a separate detachment, and incorporated one Army National Guard Battalion. The three battalions replaced the separate aviation detachments at the Special Forces Groups. In July 2007, the regiment activated a fourth battalion to meet growing special operations forces requirements. Eventually 2nd, 3rd, and 4th Battalions will be identically organized with two Chinook companies, a Blackhawk company and a maintenance company. In July 2010, a Gray Eagle Unmanned Aircraft System (UAS) element from Ft Huachuca, Ariz., was assigned to Special Operations. The element was rebranded with the USASOC patch and deployed to Afghanistan. Eventually two Gray Eagle companies will be stationed at Fort Campbell, Ky. Some of the named operations the 160th has participated in include: Urgent Fury, Prime Chance, Just Cause, Desert Storm, Gothic Serpent (led to the Battle of Mogadishu), Operation Enduring Freedom, Operation Iraqi Freedom, and Operation New Dawn. Today, 160th SOAR has almost 3000 soldiers and more than 200 aircraft.